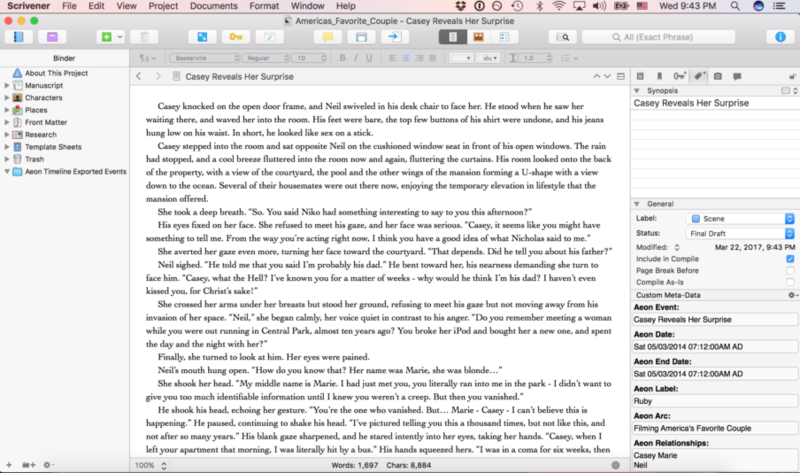 Guest Post: Scrivener is Awesome! Hey guys! Renee here – Bright Little Light Press has invited me to guest blog for them from time to time, so today I want to talk a little bit about my favorite writing tool: Scrivener. I’m a member of the Romance Writers of America, and they recently did a tool comparison of Microsoft Word versus Scrivener. It would appear that Scrivener did not come out on top. Now, I don’t want to throw anyone under the bus… but let’s just say I don’t agree with their assessment. Bright Little Light Press interjecting here: Renee isn’t alone. All of the writers we’re working with at BLLP use Scrivener. It’s widely recognized as a great tool for authors, and we wouldn’t hesitate to recommend it. It wasn’t a resounding “Yes, use this!” – which I personally find mind-boggling. I could go on and on about all the things I love about the app… but I’ll try to confine myself to the points they made in the column. I started using Scrivener in 2010 – for NaNoWriMo. I didn’t get it with days or weeks in advance to learn a new tool; I literally sat down and started using it without reading a single tutorial, instruction manual or video. (There were also far fewer video tutorial options at that time than there are now.) It took me less than five minutes to figure out how to create a project, which came with a default chapter and scene, and start writing. And then there’s the fact that Scrivener really shines when it comes to all the different Compile options – when it’s time to turn your collection of documents into a manuscript. It’s far more versatile than Word when it comes to outputting to various formats (including PDF, ePub and Kindle’s .mobi format) – and you can have really fine control of how your final output displays. So if you’re not just using Scrivener to write a book, but to prepare it for publishing, it earns its keep far beyond the capabilities of Microsoft Word. I’m not saying it’s for everyone. People who are set in a certain way of doing things and who don’t want to learn a new tool may simply not like Scrivener because it’s not Microsoft Word. But I don’t want people who read an article criticizing Scrivener to be put off by concerns about a steep learning curve – the advanced functions of Scrivener do require a little more time and effort to master, but basic functionality in the app is pretty darn simple. That being said, yes, I wrote in Word before I learned about Scrivener. I don’t blame writers for using Word if they’ve never encountered Scrivener before. But Scrivener is really a writer’s tool, whereas Word is a bog-standard word processor. In my opinion, Scrivener is the ideal application for serious genealogists! Documenting genealogy and family history is similar in many ways to writing a novel or a script for a long movie documentary, although hopefully the genealogy is all nonfiction. While I keep large amounts of data in my genealogy application, I use Scrivener right beside it to write documentation, primarily in the form of brief biographies and associated data summaries. The binder is perfect for organizing these according to families and relationships along with research notes. I move content written in Scrivener to my website with very little reformatting. Scrivener is not for genealogists who focus primarily on just finding ancestors, but for those who demand evidence for every relationship and event in their ancestors lives and seek to summarize it all in text, Scrivener is a near perfect tool. The learning curve is not at all steep compared to learning the tricks and techniques of advanced genealogical research. I am loosing my mind. Is there a tv script template? I have three projects that all look different structurally and folders etc. I can copy content from one project to another. I just need a fresh starting point. We’re sorry to hear about that, Steve – it sounds frustrating! We’ve polled our authors, and none of them have used Scrivener to write scripts. However, a little Google searching shows there is a “script” mode in Scrivener. From our very limited experience, it seems there probably isn’t a ‘script’ template. I wish I knew someone to refer you to for more info, but I haven’t the foggiest!